Bison meat is similar to beef and is cooked in much the same way. The taste is often indistinguishable from beef, although bison tends to have a fuller, richer (sweeter) flavor. It is not "gamey" or wild tasting. Bison is low in fat and cholesterol, and is high in protein, vitamins and minerals. Fresh cut bison meat tends to be darker red and richer in color than many of the other red meats. The lack of fat insures that bison meat will cook faster. Fat acts as an insulator - heat must first penetrate this insulation before the cooking process begins. Marbling (fat within the muscle) aids in slowing down the cooking process. Since bison meat lacks marbling, the meat has a tendency to cook more rapidly. Caution must be taken to insure that you do not overcook bison. Don't season the meat until almost done cooking as this dries out bison meat as it's so lean. Don't squeeze down on the burgers as that takes out the natural flavoring and could also dry them out. When oven broiling bison, move your broiler rack away from the heat about a notch lower from where you normally broil your beef steaks. Check your steaks a few minutes sooner than you normally would. 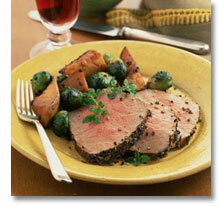 If you normally cook your roast beef at 325ºF, turn your temperature down to around 275ºF for bison. Plan on the roast being done in about the same amount of time as with a comparable size beef roast. To insure the temperature you prefer, we recommend using a meat thermometer indicating the internal temperature. Ground bison or bison burger is also leaner (most ranging about 88-92% lean). It will also cook faster so precautions must be taken to not dry out the meat. There is very little (if any) shrinkage with bison burger - what you put in the pan raw will be close to the same amount after you cook it. Pre-formed patties tend to dry out faster when grilling. (Hint: the thicker the patty, the juicier the burger). Although ground bison is leaner, there is no need to add fat to keep it from sticking to the pan or falling apart. All meat, no matter the leanness, has enough available to cook properly. The great thing about ground bison, you don't need to drain off any grease from the pan! CLICK HERE FOR SOME GREAT BISON RECIPES!